List Rules Upvote the Major League Baseball fights that were the nastiest in sports history. Baseball can be an extremely testy sport, can't it? As is true for many sports, just one thing can set players off, resulting in bench-clearing brawls on the baseball diamond. Whether it's the tension of a classic MLB rivalry, a player getting hit with a pitch, or someone plowing through to get to a base, almost anything can incite a fight, as seen in these crazy baseball brawl videos. On top of the action on the diamond, some players let their emotions get the best of them tossing a few fisticuffs around. Many times throughout the storied history of baseball, nasty brawls and intense fights have broken out between players, managers, fans, and umpires. Hit with a pitch? Better throw some punches! Can't stand your cross-town rivals? Better clear the bench and make your opinion known... with your fists. Teams like the New York Yankees and the Boston Red Sox are not strangers to an on-field melee, constantly going at it seemingly every time they play ball. Hockey might be known for its fights, but Major League Baseball has seen its fair share as well. These baseball fighting videos feature some of the craziest, nastiest brawls in the history of the MLB, resulting in ejections, suspensions, and more than a few unwanted injuries. Which of these baseball fights is the craziest? Cast your votes now and steer clear of angry pitchers! What happens when you get one of the game's best pitchers really upset? A couple of swift uppercuts, that's what. Former Texas Rangers pitcher Nolan Ryan proved this during a game against the Chicago White Sox in 1993, when he beaned Chicago's Robin Ventura with a pitch during his at-bat. Ventura wasn't too pleased with Ryan's decision, as he rushed the mound and was welcomed with those aforementioned punches and a headlock from the 46-year-old pitcher. Both benches cleared as the two guys were at the epicenter of the action before order was restored. During a tight pennant race in the dog days of summer, things can certainly get heated as emotions run high. That was the case in this 1965 brawl between the L.A. Dodgers and in-state rival the San Francisco Giants. With two future Hall of Fame pitchers on the mound that day (Juan Marichal for the Giants and Sandy Koufax for the Dodgers) Marchial had brushed back a few L.A. hitters in hopes of setting the tone for the game. When he had his turn at the plate, Dodgers catcher John Roseboro retaliated, throwing the ball back a wee too close to Marichal's ear, which, naturally, he wasn't happy with. 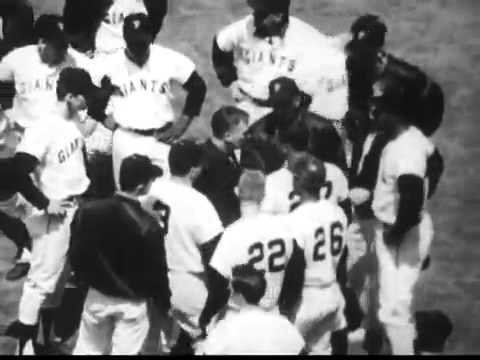 After a few repeats of this little trick, Marichal clocked Roseboro on the head with his bat. The blow opened up a two-inch gash that required 14 stitches and started a bench-clearing melee. As you can see throughout this list, any time two divisional rivals matchup against one another, there's no telling what might happen. The New York Yankees and Baltimore Orioles proved that during this ridiculous 1998 fight in the old Yankee Stadium. 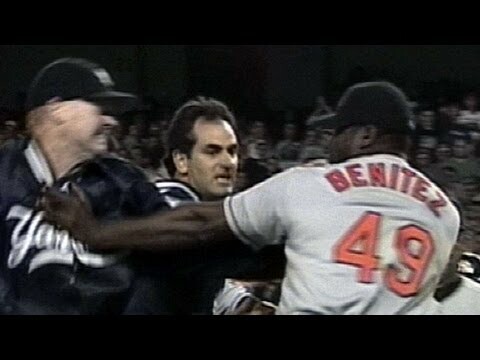 After Orioles pitcher Armando Benitez clocked Yankees player Tino Martinez in the back, it was fully on, with the pitcher putting his dukes up and looking for someone to fight. That someone ended up being New York's Darryl Strawberry, who took a sucker-punch from Benitez and, in the end, nearly every player was involved in some way. For anyone who saw this fight firsthand, it's one that probably won't soon be forgotten. That's because it resulted in 72-year-old New York Yankees bench coach, Don Zimmer, being tossed to the ground by then Boston Red Sox ace pitcher, Pedro Martinez, during a 2003 American League Championship season matchup. These two teams really hate each other (the biggest understatement of all time) so anytime they get together, a legendary brawl is always a possibility.